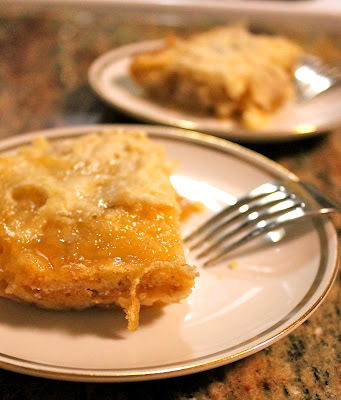 Ever since I made THIS REALLY YUMMY PEACH CAKE, I have become a little obsessed with making these cakes. So, I figured, why not make one with my drunken pears? This one I am doing a bit differently. If you can imagine it, this cake is even easier than the other cake. I know, it's mind blowing, but it's totally true. I canned my drunken pears myself, so I know you might not be able to find those in a store. 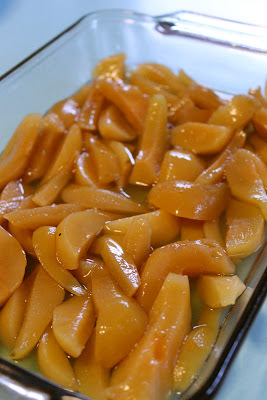 If you get around to canning your own pears, I highly recommend it! You could remedy this by just using good old fashioned canned pears. If you are feeling really fancy, you could spike some store bought canned pears with rum. Whatever gets you there, I'd say. So the ingredients couldn't be simpler, which is a big draw for me to this recipe. Fast and simple? Put me on that train! We've got a half a box of yellow cake mix. 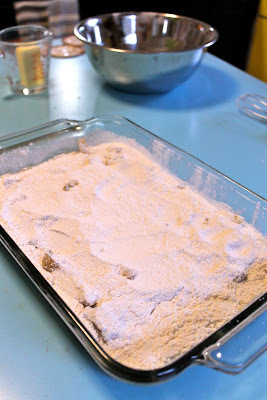 Well, to be honest, I made my own cake mix by halving my favorite recipe CLICK HERE to get it. Two pints of drunk pears, and 1/2 stick of butter which we're gonna melt in the microwave. Add your pears, along with their juice. Now add your cake mix over top. Poured it over the whole dang thing!!! 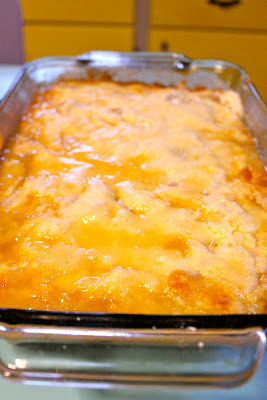 Then I baked it in the oven on 350 degrees for about 45 minutes. Check it halfway through and if you notice dry places, use a shot glass of water to moisten it. Here she is all finished and fresh from the oven. It would probably be fabulous with a little ice cream on the side. Don't you think? Either way, it was fabulous! Pour your drunken pears, juice and all, into your pan. Top that with your cake mix . 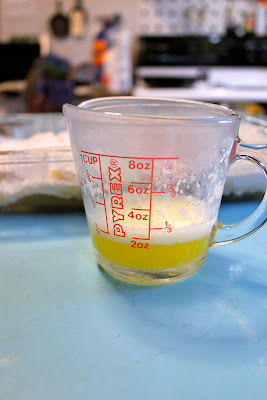 Melt your butter in the microwave and pour it over the whole thing. Bake the cake, uncovered, 35-45 minutes. Half way through cook time, check to be sure the moisture is reaching all the portions of the cake. If it's a little dry in places, use a shot glass to moisten it a bit and carry on with the cooking.